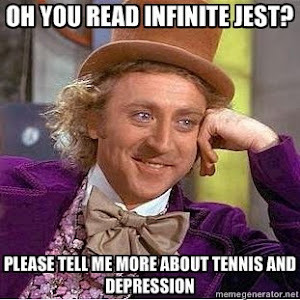 OK, I really thought I was getting somewhere, as one or two of DFW’s loose ends began to tighten a little but then the prospect of wading through 20 more pages of adolescent tennis prodigies whining at each other in various states of undress began to take its toll, and I experienced my first real wobble, wondering what the hell I’m doing with this book, this blog. 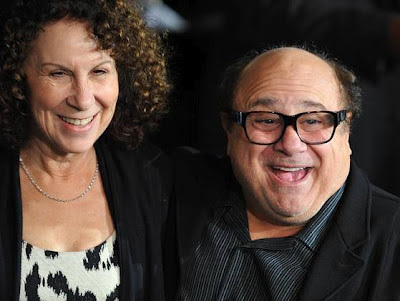 And then the toad work got a bit squatty and overbearing and then the news that Danny DeVito and Rhea Perlman are splitting up sent me into an emotional tailspin and I found myself staring at the words and nothing was going in. Every time Lewis-Kraus singled out one of DF’s sentences for excessive dickheadery, I would sit there for a minute going, “What's the problem?” It took several paragraphs before I figured out that GL-K’s only issue with these sentences is that DFW treated his readers as if they may have at some time read other writers. I mean, I read because I like words and I like knowing things. It’s fun. Sorry if my freak pleasures offend you, but there they are. If I have to look something up or learn about one of history’s seminal philosophers, it doesn’t harsh my buzz that much. The writing that really makes me feel condescended to is the stuff that talks down to me. Or the writing that reproves a great writer because he didn’t. Well, exactly. Well, except for the “harsh my buzz” bit, that’s just silly.